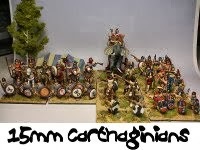 The current status of my DBA 25mm Later Carthaginian II/32 and what figs i have and don't have. 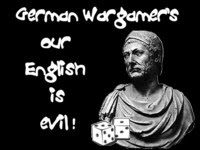 The army consists of 1x3 Cv (Gen), 1x3 Cav, 3x3 Sp (Punic spears), 3x3 Wb (Ligurians), 2xEl, 2x2 Lh (Numidians) and 2x2 Ps (Numidians)! My plan is to get an all option army. Shown are the miniatures i have exculding the Punic cavalry. I am not sure which manufacturer i will use. Any ideas? The goal is to get this figs done in 2013! So, stay tuned and follow the progress!